HIT PICK TO CLICK: SPAWN #200: Five signs this book is an event of biblical proportions: 1) A non DC/Marvel/Archie title hits 200. 2) The new Spawn faces his greatest enemy, who has his oldest one Clown at his side. 3) GOD gets in on the action. 4) Creator Todd McFarlane and Greg Capullo return to interior art duties. 5) Variant covers by McFarlane, Capullo, David Finch, Jim Lee, Rob Liefeld, Marc Silvestri and Ashley Wood. MILESTONE FOREVER #1 (DC): Old threads are tied off and new ones begun, as all the original Milestone artists return, along with writer Dwayne McDuffie, to the Milestone characters, now firmly set within the new DCU. MS. MARVEL #50 (Marvel): Forget being a lady, Ms. Marvel and Mystique clash in a 'winner takes all' brawl of a final issue, and it's one that Carol Danvers may not walk away from. INVINCIBLE RETURNS #1 (IMAGE): The biggest comics star outside the 'Big Two' in years lands his own 'get up to speed' one-shot, giving new readers the chance to jump on board before next months Viltrumite War launches! ZOMBIES vs. ROBOTS ADVENTURE #1 (IDW): What the title didn't sell it? This ish kicks off a new 4 part series, with each issue a collection of serialised tales, wrapped in a cover by ZvR mainstay Ashley Wood. GREEN LANTERN #51 (DC): Hal Jordan unleashes the one force capable of taking on the Black Lantern Spectre: Parallax... But can even he control the entity that once consumed him? 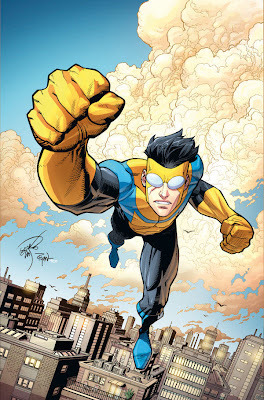 COVER OF THE MONTH: INVINCIBLE RETURNS #1 (Erik Larsen Variant) (IMAGE). While for me personally, Erik Larsen's art has its ups and downs, in this alternate cover for Invincibles 'new reader friendly' one shot, he manages to add just enough Kirby-factor to Robert Kirkman's breakaway superstar to make him iconic.